My dog'o'wars... i have a pipe+sheet metal bracket bolt together method, for a really strong metal one, but i thought that was a bad idea because i wouldnt be able to repeat it. so im going to attempt it with moulding. I think this one is better. and im going to make a proc genner for it, based apon the bin size of the electrical motors. It gets beefier the bigger the motors are. The yaw axis is a restricted axis, 90*, the pitch is 180*, and the spin is 360*. Im going to try 3d printing for the moulds, but im going to do moulding so i can get quick repeats. The cylinders you see are electric motors, and they attach the outer rim, to the previous part of the leg, and the inner portion, attaches to the next, i plan on locking the inside with the outside, by locking 2 halves together like a split pea. I need it to be thick because the stuff im using to mould it is probably not going to be the toughest. The leg signals i plan on brushing down from bracket to coupler bracket to coupler and i think the leg at the hip starts off with 60 signals that i have to make room for! its going to be a tight fit. But i think im just going to get the structure down, and worry about that later. My first mouldings will be fairly weak, and im planning on using charcoal for the conductor, but thats got heaps of problems yet. Cant keep a good boy scout down! 2 Likes Freddy and Zero like this. Re: my next body design for my xwalker. Those motors are gonna need some serious torque, right? You could add some springs or elastics to get the structure into equilibrium with gravity, then the battery can be lighter too. Exciting stuff you're working on. 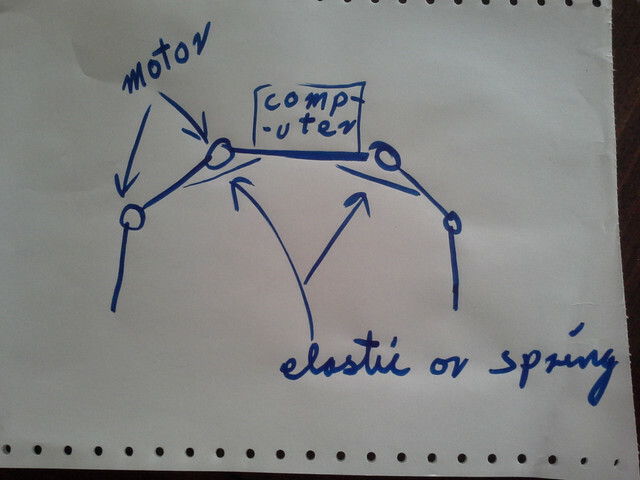 Springs or elastics to help the motors carry the weight against the direction of gravity, like a counter balance. The spikes remind me, pitch motors will need to be stronger, the inside motors will probably need to be the biggest. So to lift a leg, the creature will use strong central motors to lift smaller light weight motors at the feet. Yes, two motors controlling each joint, which is cool because if you are already building a joint you may as well double the power. I tried that on my bicycle and discovered that shaft alignment is a problem at high speeds, vibrations ensue and you end up being mistaken for a motorcycle gang. Anyways your design will probably not have that problem. Universal joints improve everything. Good luck. Im not sure if I get the counter balance idea, im interested - if u could post a diagram explaining what you mean a little simpler - i might be able to understand. I tried making a humanoid with a similar concept, i drew it up pretty quick and this one isnt as correct. main note is i make the motors short and fat, like an e-bike and i alternate the hip and shoulder than the rest of the joints, then pretty much its balls joints connecting to ball joints, with head, hands and feet and a vest over the spine. and i think im happy with this as the basic idea - but this is not an exact model, (the spidder was more exact.) its just a rough out. My robotics company is going to handle spiders, men, and horses. And I want to bring back the horse and cart days. These go at either side of the motor, one is the position potentometre, and the other is the commutator for powering it magnetically left and right. and the centre is a radius of concentric circles that send a line of data at any rotation. And theres no wires!! its all done rigid through brushing connections. I think could possibly use copper tape as long as it has a 10 micron indention for it, and its superglued down very well. Looking at your robot sketch and all those joints, they reminded me of those "universal joints" used on automotive drive shafts of which I have changed my share. So perhaps you're going for the "Universal Robot" or Universal soldier? Maybe you could build 'Spike' and enter it in TV's "Robot Wars"... a battle to the destruction of other bots in an enclosed arena!! Quite a show! No I dont think so, my shits a little too shocking, (the kids would be going insane if they saw my beast!) except to just put random posts where people dont believe im serious, and i get away with a little deluded boastery and niche interest development for your fine website. Like this. Probably not a good idea anyway since it could also pull the leg sideways. Have you considered air muscles? (Made from sections of rubber tube and tecflex. )Might be worth a bit of research if you need joints which can maintain a certain position without power expenditure. Could use liquid CO2 in a canister. Would cool cpu and propel the robot at the same time. OH I GET IT!! So its like tendons! I understand now. sorry for being a bit dumb in the head, I didnt quite picture it right. the pic definitely clicked me. Funny how a robot is a computer on legs. It would be a more natural mammal type design with those in it. On motor bikes they have air coushioned springs, and on the security doors in australia we all get an air coushioned door reset which is similar. That looks like its not a bad setup for adding springs to droids, ill keep it on the shelf. The dc motor design ive done doesnt need them mandatorily, but it is not a bad idea, since doing it with dc motors is definitely not the only way to make a body, and piston like methods are actually superior in lots of ways. (dc motors wear out, they waste alot of power, they require magnetized iron, they are noisy, sparks fly.) pneumatic spring piston type stuff is alot quieter. adjusted the hips to hang off 45 degrees. and just managing the scales of the motors. and this one works better than the last one, but its still pretty rough. Doing the dc motors / bracket design with a full ball action every joint makes it pretty technical looking, i dont mind it so it much, but i think this one needs a tiny bit more chunk to it, so im going to make another one to try and best this one. But all this doesnt matter, I need it in my proc genner where its actually going to put out the moulds im going to get 3d printed 2018 style off the web, and im working on it now. just a little screen space csg machine. to put his knee up straight, but it may be ok, but putting the knee inward it probably have to bends its from its knee position inward a bit late to do it.